In Shuvalov’s case, he insisted that under no circumstances could he consider sitting down upon the seat proposed for him as chairman of the board of one of the most lucrative property deals in Moscow – the multi-billion redevelopment of the Exhibition of the Achievements of the National Economy (VDNKh); this is now known for modern reasons as state-owned stockholding company (GAO), Vserossiyskiy Vystavochny Centr — VVC. Today, according to Yegorova, it turns that Shuvalov has changed his mind and VVC is installing him right where we reported he wanted to be. Yegorova now says: “we confirm that Igor Shuvalov is an affiliated person of VVC since May 16.” What the coy phrasing means is that on May 16 Shuvalov became chairman of the board of directors of VVC. 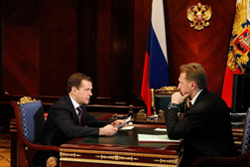 The next day, on May 17, in the presence of Medvedev, Shuvalov reported on the operation to replace state ministers. He appeared to imply that Medvedev means to replace only those state officials on state company boards who are not irreplaceable. “We need to find the candidates [as board replacements] who have the required skills to understand highly complex issues, and to protect impartially the interests of the companies whose boards they will sit on,” Shuvalov told Medvedev. “It is a difficult job”, he added. He said nothing about the supreme difficulty of replacing himself. “Somebody has to represent the state’s interests,” the president said sympathetically. 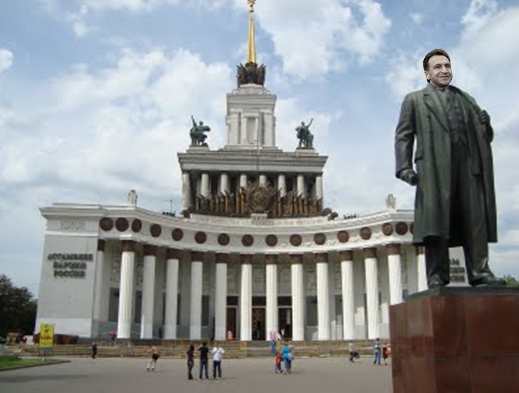 This suggests that Medvedev and Shuvalov have agreed that in order to supervise an amusement park and real estate development in Moscow, noone in all of Russia save Shuvalov is fit for the job. This also suggests that Medvedev’s replacement targets are only those ministers whom Medvedev judges to be politically opposed to his re-election, such as Igor Sechin. To substitute for those who appear to be endorsing Medvedev’s political future – Shuvalov, for example, or the presidential chief of staff, Sergei Naryshkin, chairman of the board at state shipping company Sovcomflot – turns out to be impossible. Then again, perhaps Shuvalov’s change of heart is also a change of mind about who in Russian politics today is replaceable by whom. Shuvalov’s chairmanship may represent the calculation that it will be Medvedev who now faces replacement. Shuvalov’s office refuses to accept or answer questions by any medium except by hand-delivered mail. Fax, Shuvalov’s receptionist says, can only be used to deliver invitations to the First Deputy Prime Minister.